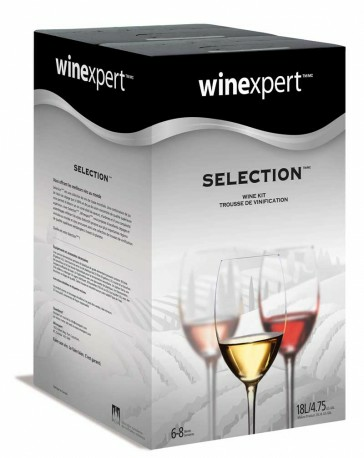 Winexpert`s Selection Italian Brunello Style with Grape Skins is a dark-cherry color with highlights of gorgeous ruby-garnet. Bold, yet supple, the big, smoky-earthy nose of ultra-ripe cherry and currant-like fruit gives way to a hint of tar and cracked black pepper, cedar, whiffs of liquorice, leather, and also plums and black cherries, followed by a richly tannic, long, long finish. The super concentrated flavours are generous even in youth, but this sensational wine is sensational after six months to a year. Good acidity makes this a very food friendly wine: like many Italian reds, Brunello shines in the company of assertively flavored foods. Osso buco and veal piccata are splendid accompaniments, as are hard cheeses such as asiago and Pecorino Romano. Its firm backbone of acids and tannins make it work well with rich and spicy foods like Italian sausages or lasagna.